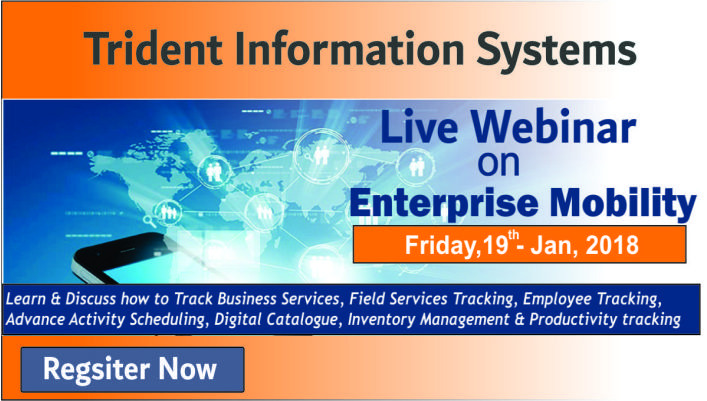 Join our upcoming Live webinar to learn how to track Business Services, Field Services tracking, Employee Tracking, Advance Activity Scheduling, Digital Catalogue, Inventory Management, Productivity Tracking, Business Growth Tracking, etc. Mobility is at the core of digital transformation. Mobile devices have transformed from just enabling business emails and data on the move to mobilizing enterprise applications, driving innovation and changing the way companies do business. Today, mobility solutions and services help companies leverage contextual, real-time data to reach out to customers, employees and partners anytime, anywhere. Field Service Tracking : Field Service tracker solution provides advanced Tracking, Inventory tracking, Operation tracking, Field Movement, Order Management that enables the field services delivery teams to be able to track, monitor and report the services activities on the go. The solution enables the organizations to be highly agile and responsive to the customer needs, capture their feedbacks and concerns on the spot with constant alerts and status updates.